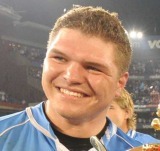 Kruger was drafted into the Springbok touring squad for their November tour in 2010 after a good Currie Cup season. Having already appeared for the Emerging Springboks, Kruger won further acclaim after being named in South Africa's 49-man provisional Rugby World Cup training squad for the 2011 tournament. In July 2011, he was handed a maiden Test call - against Australia in Sydney.